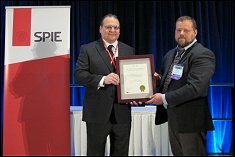 Prof. Wereley, on behalf of the TSI/UMD SAMSS Development Team, accepts the SPIE Smart Structures Product Implementation Award presented by Dr. Kevin Farinholt. The 2013 Smart Structures Product Implementation Award was presented to the team of Techno-Sciences Inc. (TSi) and the Smart Structures Laboratory at the University of Maryland, Department of Aerospace Engineering on March 12, 2013 at the SPIE Smart Structures/NDE Symposium in San Diego, CA. This award recognized the development of the Semi-Active Magnetorheological Seat Suspension (SAMSS) System for use in the SH-60 Seahawk Helicopter. TSi and the University of Maryland are currently working to develop similar systems for a variety of vehicles including other military helicopters and aircraft, ground vehicles, and fast boats. In addition, four joint TSI/UMD patents have been issued for this product and related products, and two patents are pending. This product development was the outgrowth of a doctoral dissertation written by Dr. Greg Hiemenz (Ph.D. ?07), Vice-President of Advanced Technology Development (TSi), and advised by Prof. Wereley. Whole body vibration is a significant concern for helicopter pilots and passengers. Studies have shown that back pain and spinal abnormalities are common for pilots, with pain in the lumbar region, buttocks and legs beginning 2 to 4 hours into the flight. Increasingly common long flight times for military actions exacerbate the problem and can lead to pilot inattention and distraction and, consequently, loss of situational awareness and poor decision making. Current seats are designed for crashworthiness, not vibration. The Semi-Active Magnetorheological Seat Suspension (SAMSS) System addresses this performance shortfall. Magnetorheological dampers, a key component of this system, are capable of achieving what is effectively a continuously adjustable device. In combination with a real-time feedback controller, these dampers can adapt to occupant weight and respond to changing excitation levels and frequencies. These devices exhibit low power draw and high mechanical reliability; and, additionally, in a power-out/ fail-safe condition, these devices operate like a conventional hydraulic damper. TSi and the Smart Structures Laboratory at UMD worked together to design the seat suspension system, which has been flight-tested for an unarmored Navy MH-60R Seahawk crew seat. The system is implemented such that crash safety is preserved, but the occupant is isolated from potentially harmful vibratory loads. The control system can minimize vibrations even as occupant weight varies, as well as varying vibratory g-loads during flight. For example, for typical male aviators, vibration reductions for seat rocking vibrations were reduced at least 85% while vertical vibrations were reduced over 60%. Most telling was a comment by a test pilot: ?I could not tell if I was flying in a helicopter or sitting at my desk.? Dr. Greg Hiemenz (Ph.D., ?07) stated that ?This award recognizes the creative innovation and design, product development and testing efforts of the TSI/UMD SAMSS Development Team, and demonstrates how effectively small companies can team with universities to tackle product development challenges.? Congratulations to the TSI/UMD SAMSS Development Team!